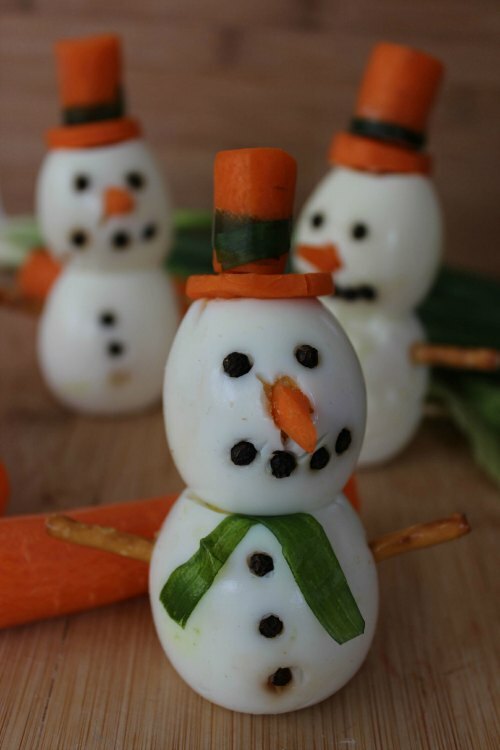 These Boiled Egg Snowmen are adorable as well as healthy. These make a fantastic healthy snack for your winter and holiday parties. These cute little winter snacks will also be a impressive show of your creativity. It is not difficult to boil an egg perfectly every time. 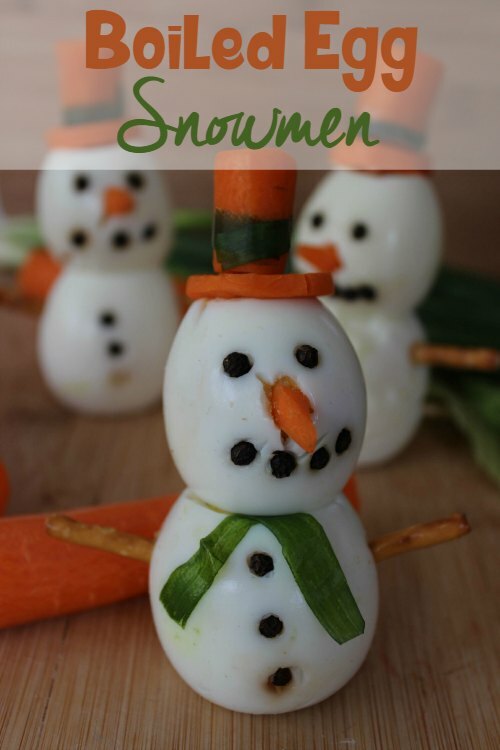 You will need 12 hard boiled eggs to make 6 of these boiled egg snowmen. To make a perfect hard boiled egg, place your eggs in a pan and cover the with cold water. Bring to a boil and then place a lid on your pan as you turn off the heat. You will then let them stand for about 15 minutes. Cool your eggs in a bowl of cold water until they are no longer hot when you touch them. Then peel when you are ready to decorate. If you are going to serve soon, you can use pretzel sticks to join each piece and they will be completely edible. If they need to sit for a while, the prezels will become to soggy, so you will have to use wooden skewers. Slice the thick end of carrot into six ⅛" slices to use as hat brims. Slice middle of carrot (or smaller carrot) into six ¾-1" slices for top of hat. Use skewer to "pre-drill" hole in carrots to allow pretzel to connect them with remainder of stick extendeding below brim. Take the small end of a carrot (about ½") and cut lenghtwise into six sections to use as noses. Using a toothpick, pierce "face" egg in the middle and insert the nose. Pierce the "body" egg three spots to make buttons and press in peppercorns. A much healthier snowman than the donut ones! And those carrot hats are really cute. Thanks for sharing with us at the #HomeMattersParty link party. These are so cute! Not cute enough not to eat though…I love eggs! Found you from the Dream to Reality party. Following on Twittter.